Now that we have discussed the differences between the honorable Empire and the traitorous Rebels, we shall move on to the next topic of discussion - objectives. Armada is not some barroom brawl with the only goal being the destruction of your enemy. If you can outsmart and outplay your opponent, you can be victorious without firing a single shot. This is all made possible by the inclusion of objectives. When you build your fleet, you choose one objective card from each category - Assault (Red), Defense (Yellow), and Navigation (Blue). Without going too deeply into Initiative, the player who spent fewer fleet points chooses to go first or second before looking at their opponent's Objective Cards. Once Initiative is determined, the first player picks one of their opponent's objectives for the game. - First, the color along the top tells us its type (Navigation). - Setup includes any rules that modify standard board setup, including deployment, placing of objectives, whether a certain ship has to be nominated for the mission, and any additional tokens that need to be placed or allocated. - Special Rule describes what effect this objective has on the game. - End of Game tells you any additional steps you have to take once the game has finished. - Lastly, the bottom-right corner tells us how many points you earn by claiming victory tokens or controlling certain parts of the battlefield. Now let us discuss each objective, when to include it as part of your fleet, and when you might want to choose it as first player. As a rule, Assault Objectives (Red) increase your ability to damage your opponent. They tend to be the most straightforward to use, but you will find that they will not always be to your benefit. However, the bonus granted for three out of four Assault objectives is greatly increased for the second player. There are two important things to note. The first player's objective ship can attack the same ship twice, but it has to target two different hull zones. The second player's objective ship can simply target the same hull zone twice, or make two attacks against squadrons. The FAQ does state, however, that if the second player's objective ship has Gunnery Teams, it cannot attack the same ship or the same squadrons. If you have an ISD without Gunnery Teams, an MC80 or even a Demolisher Gladiator, go for it. But don't expect this objective to ever get selected. If your opponent chooses this one, be wary. They either don't understand the power of this objective, or they're confident they can kill your objective ship before it does any serious damage, and reap the double points. Just don't. There may be very rare instances where this objective will pay off for you. But by the time you reach the level of expertise where you can recognize them, you won't be taking advice from me on objectives. The second player gets to choose both objective ships, which is key. And this one is very straightforward - every time you attack an objective ship, you get a bonus attack die. That ship is also worth double victory points. This was FAQ'd to clarify that the bonus only applies to ships, not squadrons. Include this one if you have a decent number of ships (4+) or a few extremely lethal ships that would benefit greatly from it (MC30cs or Gladiators). It also helps to have an insignificant ship in your fleet, like a CR90 or Raider, that can serve as your objective ship and run away. This is another one you want to avoid unless the other two choices are incredibly bad. You have no control over objective ship selection, so be prepared for your most expensive/vulnerable ship to be chosen, and for your opponent's cheapest/dodgiest ship to be chosen. Your opponent will likely include this only if they can capitalize on it well. Pretty simple. The first time you fire, you get extra dice. An important note here is that the second player can add dice of any color, whether they are already in the dice pool or not. So you could add black dice to an attack at Long Range. Also important is that a single damage card on a ship at the end of the game will award half points, so you can score points by barely scraping ships. This is great if you have a lot of ships, so MSU (many small units) swarms like CR90s or Raider/Gladiator fleets can be fantastic. The important thing to remember, though, is that the bonus triggers the first time the ship fires. So if your ships have lots of Blue/Black dice, maybe hold fire until you're in Short Range. But an Expanded Launchers Gladiator with this objective is terrifying - 6 Black, 2 Red dice. Ouch. As with most Red objectives, you probably aren't going to choose this. If you have a lot of ships, your opponent only has a few, and you are more maneuverable, go for it. The ideal would be a Corvette swarm up against two ISDs or maybe three VSDs. They will get a few bonus dice, but you'll get a lot more, and you can still be effective at Long Range, where your Evades will protect you from Black dice. This is one of the most common Assault objectives. The way this objective works is that you roll your attack dice normally. Then, if you have any dice with a HIT symbol (this includes Red HIT/HIT dice, and Black HIT/CRIT dice), you can "spend" it to flip a facedown damage card that is already on the target face up. Spending the die removes it from the attack. So you are effectively reducing your damage by one or two to cause a critical effect and gain a token worth 15 points. Only ships and squadrons with the Bomber keyword can trigger this effect. Include this if you have a lot of ships or a lot of Bombers. While you don't gain an advantage over your opponent (other than that free Concentrate Fire token, WOOOO! ), this is an objective you can build your list to capitalize on. I've gained almost a hundred points in a single game due to this objective. But it constantly forces you to debate between causing damage to kill the ship, or triggering critical effects and gaining bonus points. If you have a decent amount of ships and/or bombers, this can be a great fall back. This is one of the most commonly chosen Red objectives, because it's easy to gain points from it. Defense Objectives (Yellow) tend to focus the battle somewhere specific, or change deployment. Very straightforward. Whoever has the highest total Command value at distance 1 of the station gains 20 points. You check at the end of every round. Generally, you want to have either one Command 3 ship, or multiple Command 1/2 ships that can be effective at range and don't rely on maneuverability. This objective was almost custom made for ISDs or VSDs. Rebel players could also get some use out of this with Assault Frigates, MC80s or Nebulon-Bs, although maneuvering can be trickier. If you're confident you can destroy most or all of your opponent's fleet, this objective can be great. You know exactly where part or all of their fleet will be. If you also have lots of high-command ships, especially ones that rely on point blank range (ISD-Is and VSD-Is), this could work. But bear in mind that it's easy for your opponent to block you from getting close to the station, so you may have to overcome a 120 point deficit if you can't wrestle the station away. There are a few things of note here. One, you only include dice from your battery armament when checking for control. So things that "increase battery armament" like Enhanced Armaments are counted. Things that "add dice", like Ackbar, Concentrate Fire, etc., do not. And two, there is no minimum distance the tokens have to be from each other, so you can place them in a stack if you want to. You also have to be very cautious, because overlapping a token means that your opponent automatically controls it. And lastly, it's 15 points per token, meaning there are 45 points up for grabs every round. Use this objective if you have lots of ship dice that don't rely on maneuverability. This is another one that favors powerful, durable ships like ISDs, VSDs, MC80s and Assault Frigates. You only want to take this objective if you have a LOT of dice at Long/Medium range. Also be sure to deploy in a way that you can reliably have a lot of dice on the objectives the entire game. There are 270pts up for grabs. This one is a risk. Only choose it if you have a LOT of Red dice, or can get the rest of your dice to the objective quickly. Dual ISDs could work (with sixteen dice from their front arcs and Speed 3), or a CR90 swarm. But this objective locks you in to a single area, so be sure you can handle a toe-to-toe bout. This one was discussed in another post. Basically, the first player has two deployment zones, the standard one and the Ambush Zone, which is a rectangle in the center of the table greater than Distance 5 from every board edge. All fighters must be deployed after ships. The idea here for the second player is to break up your opponent's fleet and deal with it piecemeal. Don't. Just don't. Your opponent will only select this if they have something that's going to roll your face off turn one. 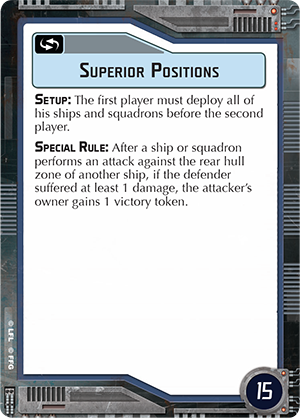 Bear in mind that they can deploy Distance 5 from your board edge, meaning their squadrons can deploy just outside of your deployment zone. A player who chooses this is going to have something along the lines of three B-Wings with Yavaris that will fire twice (twelve Blue dice with Bomber!) before you even activate a single ship. On paper, this looks great, but you almost never see this objective competitively. You may get lucky and have an opponent choose this without such a dream setup because they feel it's the least painful option, but this one can be a serious pain for the second player. Choose this in a situation described above. If you have an ISD with Expanded Hangars and five TIE Bombers, you can almost guarantee a significant kill with the first activation of the game. If you don't have something like that, avoid this objective, because you're allowing your opponent to attack half of your fleet at a time. Pretty straightforward. Second player gets to hold one Small/Medium ship in reserve with up to three squadrons. When they deploy, they can be placed anywhere with part of their bases within Distance 1 of a single objective token. Since they are deploying mid-game, you set its speed dial and command dials when it appears. When you have something that can show up and suckerpunch your opponent, or chase behind it the entire time. Insidious is an obvious choice, but something like a Victory/Nebulon/Assault Frigate and some Bombers can be a huge problem. A big thing with this objective is that it can force your opponent to constantly fear the arriving ship, possibly forcing them to hold ships off of the main line, which itself can be a victory. If your opponent doesn't have a particularly threatening ship, this can be an easy choice. Or if you find yourself faced with Superior Positions and Precision Strike against a very Bomber-heavy list, this objective may cost you a ship but can also save you a LOT of points. Navigation Objectives (Blue) obviously change the way you navigate or deploy. Very straightforward. Once you place obstacles, you place an objective token on each one. You gain tokens by overlapping the obstacles, and the second player suffers no ill effects from debris or asteroids. Each token is worth 15 points. Any fleet could benefit from this one, but especially fleets that are slow and clunky, or have multiple Large ships which have a hard time avoiding obstacles. It's also a good way to pick up some free points, and force your opponent to choose between denying you those bonus points and suffering damage. If the Red and Yellow objectives give your opponent too serious an advantage, go with this one. You're handing your opponent extra points, but it's only 75. The big thing is that they can now fly across the entire table with impunity, where you still have to avoid crashing. Again, fairly straightforward. You place five objective tokens and each player nominates an objective ship. Only the objective ship can claim the tokens, which is done by revealing a command dial within Distance 1 of a token. Whoever has the most at the end of the game gets 75 victory points. If you have a fast, expendable ship and can't capitalize on another objective, this can be a good one. It's easy enough to your three in a line on your side of the table, and scoop them up. Just watch out. A savvy opponent could suicide their objective ship across the board to try and deny you that third objective, and they do get to go first. Again, default to this if your other choices give too much away. You also need a fast, expendable ship or something very powerful to make this work. If you place your tokens moving across the table, you could pick up your two, and then pounce on a third one to claim the points. Your ship is almost certainly going to die, so make sure it's worth fewer than 75 points. This objective is easy to understand, but can be difficult to use to your advantage. The mines must be Distance 1 from each other. You can still deploy multiple mines around the same obstacle, they just have to be far enough away from each other while still in range of the obstacle. And be sure to note that a HIT or CRIT deals a card directly to the hull, ignoring shields, and if you have one or more CRIT results, the first card is face up. There is no way to prevent this damage. This can be a "nothing else works" card, but it can also be used to great effect. If you have ships with very powerful arcs, but are maybe not so maneuverable, you can use the minefields to funnel your opponent into your killing field. Another common use is to deny one side of the board and hem in maneuverable fleets. This one is tricky. It's not a default choice, but how badly it can alter your plans hinges solely on your opponent's skill at setting up the minefield. A savvy player who knows how your fleet works can cause a serious headache. This is a very common Navigation objective. There are two parts to pay attention to. One, the first player must deploy their entire fleet first, which can be a huge advantage. Second, you gain victory tokens by damaging the rear arcs of your opponent's ships. Something to note hear is that the damage has to be caused by an attack targeting the rear arc regardless of where the damage is applied. So if you fire into the rear arc and your opponent Redirects all damage elsewhere, you still get the token. But if your opponent cancels the damage via an Evade, you do not. If you have plenty of squadrons or very dodgy ships, this is almost an auto-include. Not only can you rack up tons of points (my personal record is 180 or so), but forcing your opponent to place everything before you do gives you a massive advantage. If you have a maneuverable fleet or you're confident you can win the squadron fight, go for it. If your squadrons are heavily outmatched and you're not fast enough to dodge your opponent's squadrons, avoid this one. I approve of the specific mission card Kinne chose to start this thread with. Best mission in the game!